Contact Us - Netook Construction Ltd.Netook Construction Ltd.
Netook Construction is always accepting resumes for experienced heavy equipment operators. 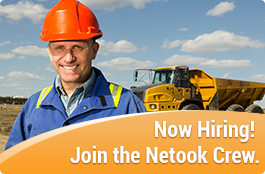 Please e-mail your resume to info@netook.ca, or fax to 403-556-6231. Copyright © Netook Construction Ltd. All Rights Reserved.